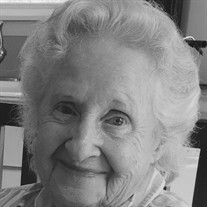 Janie Elizabeth Allman Guffey, age 85, of Rutherfordton, died Wednesday, August 2, 2017, at her home. She was a native of McDowell County and the daughter of the late Noah Allman and the late Lillian Ford Allman. She was a beloved mother and nanny and had a life long passion for gardening. She was a member of Piedmont Baptist Church. She was preceded in death by her first husband Samuel B. Guffey, her second husband Walter N. Guffey, infant son Ronald Guffey, two brothers and one sister. Laura Link and husband Lucas, Amelia Hailey and husband Stephen and Layla Gaddy and husband Marc. The family will receive friends from 2:00 PM to 3:00 PM, Sunday, August 6, 2017 at McMahan's Funeral Home. The funeral service will be at McMahan's Funeral Home Chapel at 3:00 PM, Sunday, August 6, 2017 with Dr. Diane Nelson officiating. Interment will be at Piedmont Baptist Church Cemetery. In lieu of flowers memorials may be made to Hospice of Rutherford County at P.O. Box 336 Forest City, NC 28043.